The technical and artistic excellence of Ming dynasty porcelain is without parallel. Although a tremendous variety of wares was produced, the great tradition of blue and white porcelains most confidently expresses the imperial style. The Yongle period at the beginning of the fifteenth century was one of the most glorious and productive eras in the history of Chinese art. Under the inspired patronage of the Yongle emperor all the arts flourished; none more so than the ceramic arts centred on the imperial kilns at Jingdezhen in Jiangxi province. There the characteristics of the local clay had been mastered in the production of translucent high-fired white-bodied porcelain. The technique of painting on the body of the ceramic vessel with cobalt blue had been introduced to China during the preceding Yuan dynasty, probably from Persia. 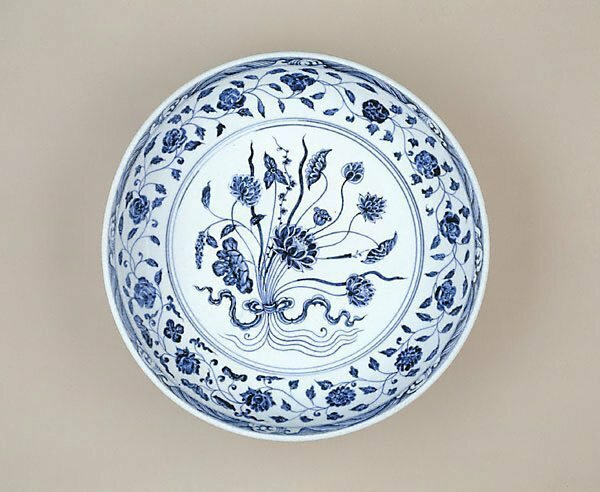 By the late Yuan dynasty (in the second half of the fourteenth century), blue and white porcelain was the hallmark product of Chinese kilns, paving the way for massive expansion and artistic fulfilment in the Ming. This large dish is a classic example of the Ming potters' art. Perfectly shaped, it is covered with a glaze rich in texture, and painted with a flourishing design of a bouquet of lotus and water plantain, with a continuous scroll of lotus blooms around the rim. Characteristic of Ming imperial wares, the shape of the vessel is in perfect harmony with the rhythms of the decoration. Art Gallery Handbook, 1999. pg. 252.